In this article, you'll learn how to develop a Java application for Android using the Cognitive Services Speech SDK to transcribe speech to text. The application is based on the Speech SDK Maven Package, version 1.4.0, and Android Studio 3.3. The Speech SDK is currently compatible with Android devices having 32/64-bit ARM and Intel x86/x64 compatible processors. For the Speech Devices SDK and the Roobo device, see Speech Devices SDK. You need a Speech Services subscription key to complete this Quickstart. You can get one for free. See Try the Speech Services for free for details. 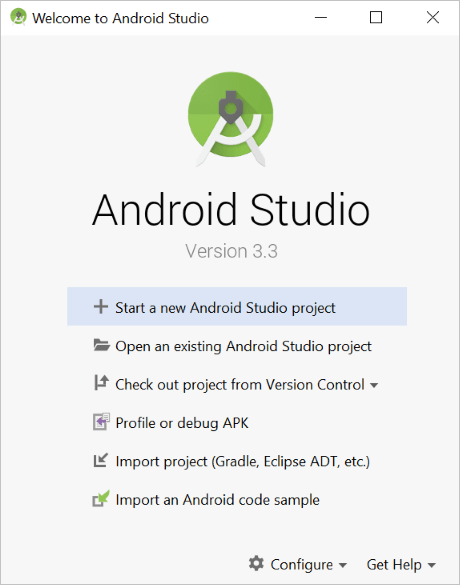 Launch Android Studio, and choose Start a new Android Studio project in the Welcome window. 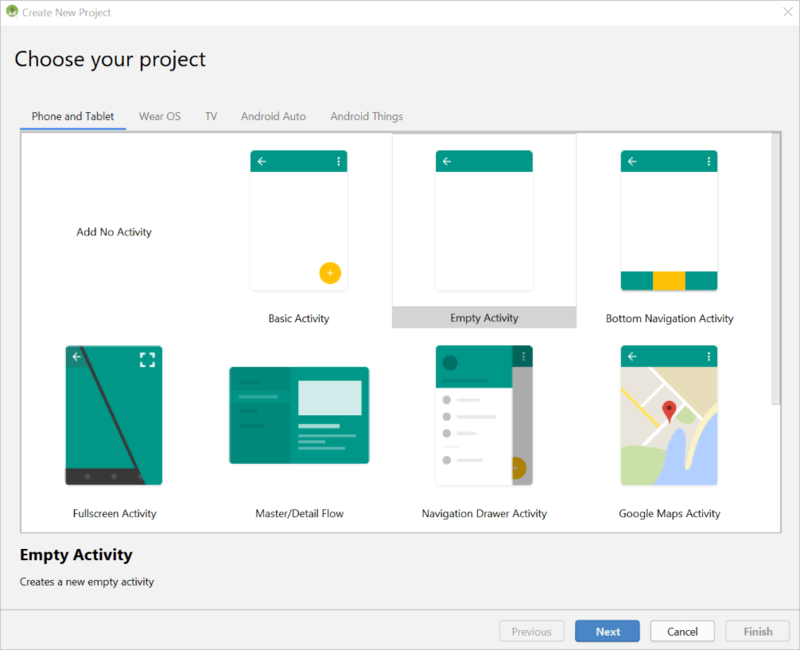 The Choose your project wizard appears, select Phone and Tablet and Empty Activity in the activity selection box. Select Next. 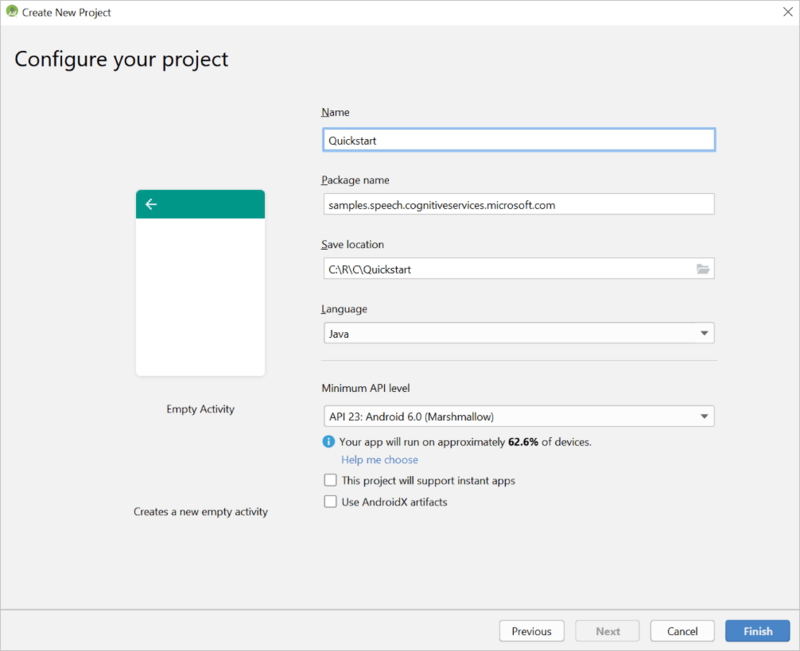 In the Configure your project screen, enter Quickstart as Name, samples.speech.cognitiveservices.microsoft.com as Package name, and choose a project directory. For Minimum API level pick API 23: Android 6.0 (Marshmallow), leave all other checkboxes unchecked, and select Finish. 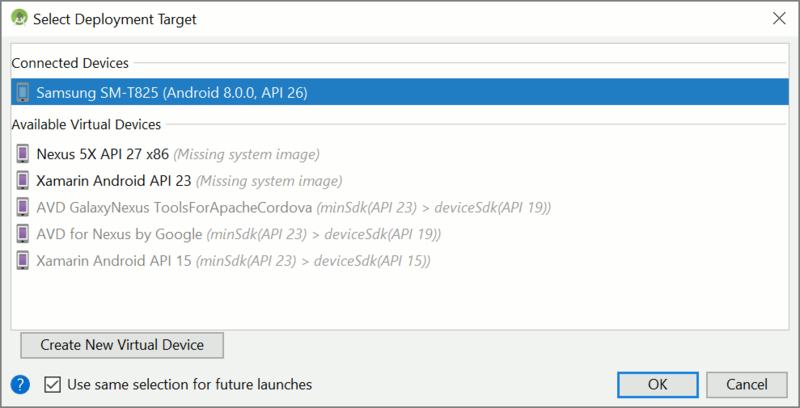 Android Studio takes a moment to prepare your new Android project. Next, configure the project to know about the Speech SDK and to use Java 8. The current version of the Cognitive Services Speech SDK is 1.4.0. The Speech SDK for Android is packaged as an AAR (Android Library), which includes the necessary libraries and required Android permissions. It is hosted in a Maven repository at https://csspeechstorage.blob.core.windows.net/maven/. In the same screen, on the left side, select app. Then select the Dependencies tab at the top of the window. Select the green plus sign (+), and choose Library dependency from the drop-down menu. Select the Properties tab. For both Source Compatibility and Target Compatibility, select 1.8. Select OK to close the Project Structure window and apply your changes to the project. We will create a basic user interface for the application. Edit the layout for your main activity, activity_main.xml. 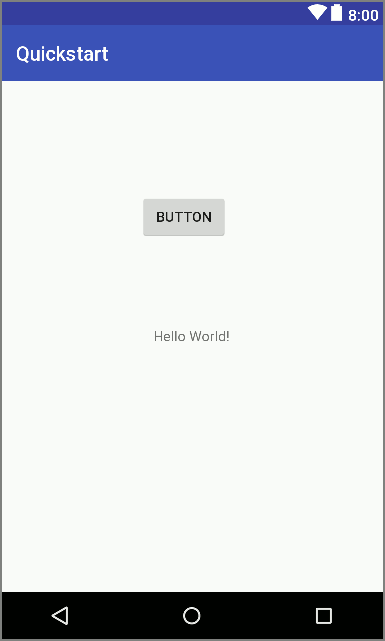 Initially, the layout includes a title bar with your application's name, and a TextView containing the text "Hello World!". Click the TextView element. Change its ID attribute in the upper-right corner to hello. From the Palette in the upper left of the activity_main.xml window, drag a button into the empty space above the text. In the button's attributes on the right, in the value for the onClick attribute, enter onSpeechButtonClicked. We'll write a method with this name to handle the button event. Change its ID attribute in the upper-right corner to button. Use the magic wand icon at the top of the designer to infer layout constraints. Open the source file MainActivity.java. Replace all the code in this file with the following. // Replace below with your own service region (e.g., "westus"). The onCreate method includes code that requests microphone and internet permissions, and initializes the native platform binding. Configuring the native platform bindings is only required once. It should be done early during application initialization. The method onSpeechButtonClicked is, as noted earlier, the button click handler. A button press triggers speech to text transcription. In the same file, replace the string YourSubscriptionKey with your subscription key. Also replace the string YourServiceRegion with the region associated with your subscription (for example, westus for the free trial subscription). Connect your Android device to your development PC. Make sure you have enabled development mode and USB debugging on the device. To build the application, press Ctrl+F9, or choose Build > Make Project from the menu bar. To launch the application, press Shift+F10, or choose Run > Run 'app'. In the deployment target window that appears, choose your Android device. 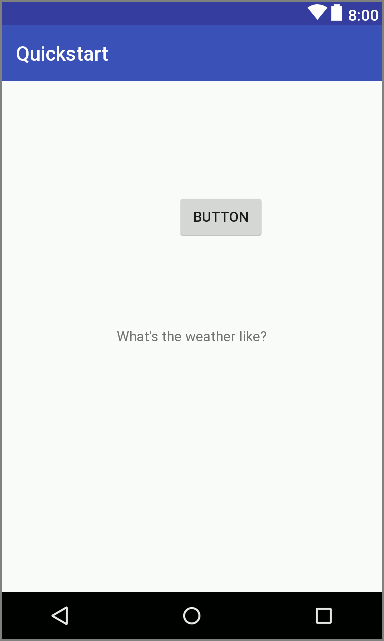 Press the button in the application to begin a speech recognition section. The next 15 seconds of English speech will be sent to the Speech Services and transcribed. The result appears in the Android application, and in the logcat window in Android Studio.